There are several types of Visas you can get to enter and visit or live in Mexico. I will discuss the 3 most popular here. FMM Tourist Card, Residente Temporal and Residente Permanente. 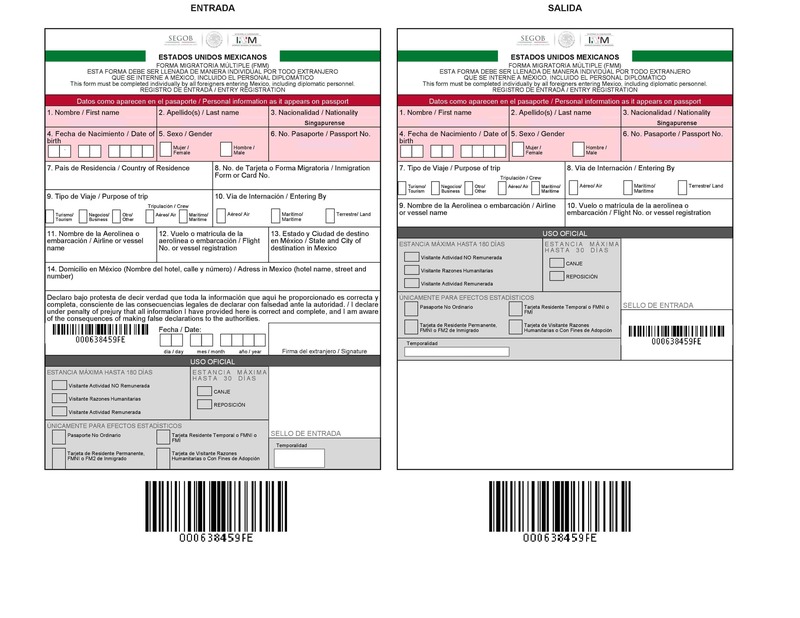 Below is the FMM form used to enter and exit Mexico for all types of Visa holders. You use the same form for all entries and exits for all types of Visas. There are some significant differences on the boxes you check for the purpose of your trip that affect your status that are very important. I will point these out under each description. If you have a Residente Temporal Visa Card or a Residente Permanente Visa Card never enter Mexico and select Tourismo/Tourism on your FMM form as the purpose for your trip as this will invalidate your VISA Card and you will have to start the process all over outside of Mexico. You must mark Other as your reason for entering. If you want to enter Mexico to visit for a few days or up to 180 Days you can use the FMM Form (Forma Migratoria Múltiple) when entering by air or land. When it asks for the Purpose of your trip you have 4 options. For this example you would choose Tourism. If you are arriving by air the cost of the FMM form is usually included in your ticket price and you would just fill out the form on the plane or after landing but before approaching the INM Immigration counter. If you are entering by land you can get the card at the INM office at the border crossing. You can also obtain the form online by clicking the button below. You can fill out the form (in Spanish) and then save and print it. You will pay the fee with a credit or debit card. When ordering the FMM online you have 30 days to use that printed document to enter Mexico and it must be stamped at the border or at INM upon arrival at the airport. When it asks for the Purpose of your trip you have 4 options. For this example you would choose Tourism. Fill out the rest of the form with your name, passport and flight information and where you will be staying in Mexico. This tourist form can be valid for up to 180 days at the discretion of the INM Officer. I recommend asking for the maximum time allowed (180 days) even if your stay is going to be shorter in case your travel plans change. There is no penalty for leaving early but there are penalties for overstaying. The Tourist Card cannot be changed or extended once issued and you must leave Mexico prior to the expiration date on your Tourist Card. If you lose your FMM form while in Mexico and are leaving by Air you will need to purchase another one ($533 MXN Pesos, $ 28 USD or $ 38 Canadian ) paid to Mexico Immigration at the INM Counter before being allowed to board the plane. If you plan on staying more than 180 days or plan on living in Mexico you will need to get either a Residente Temporal or Residente Permanente Visa. "In the past many people have just entered on a FMM 180 Day Tourist Card and then headed to the nearest border and left Mexico for a day or so and came back on another FMM 180 Tourist Card. Recently there have been reports that INM Officials are cracking down on this practice and only giving people that have done this process multiple times 7 Day Tourist Cards." If you are going to stay longer than 180 days or live in Mexico you should apply for a Residente Temporal or Residente Permanente Visa. These 2 Visa types must be applied for outside of Mexico, usually in your home country at a Mexican Consulate, and then finalized in Mexico. Each of these 2 types of Visas have their own financial requirements to meet to be eligible although the process to obtain them is similar for both types of Visas. You will visit a Mexican Consulate, provide the required documents, and if approved be given a Pre-Approved Visa in your Passport. This Pre-Approved Visa is valid for entry into Mexico only 1 time and you must enter Mexico within 180 days of issuance. Once in Mexico you have 30 Days to report to your local INM Office to begin the final process to complete the Visa. Before we begin to explain the requirements for each VISA I would like to point out that the information provided here we believe to be accurate at the time we publish it, but each Consulate may have slightly different requirements. Some Consulates only issue Temporal visas and not Permanente. Some require slightly more income than what the law says and some Consulates may require a background check or police report. Just be aware so you are not surprised or disappointed. To become a Resident Temporal (Temporary Resident) you must meet minimum financial requirements (each person). If your bank accounts, investment accounts or any proof of income accounts are in both you and your spouses names the statements provided to the Consulate must have both names printed on them. Most Consulates want originals and not copies. If you only have online statements you may need to print them and go to your bank or financial institution and have them stamp and sign/initial each page. You may also need a letter from the branch/office manager stating the documents are issued by them. The Residente Temporal Visa allows you to live in Mexico full time. The Visa will initially be issued for 1 year and may be renewed from within Mexico for up to 3 more years. After 4 years you can change to a Residente Permanente from within Mexico and without providing further financial documents. You must obtain a Work Visa in order to have the right to work with this Visa type. Residente Temporal Visa holders may import and drive a Foreign plated vehicle. Monthly Income - Approximately $ 1,405 USD or $ 1,881 Canadian at today's exchange rate. Investments - Approximately $ 23,411 USD or $ 31,350 Canadian at today's exchange rate. Own a home in Mexico - Approximate Value $ 187,289 USD or $ 250,801 Canadian at today's exchange rate. You will need the original and a copy of your deed. These requirements are for each person. Consulates may require less income proof for the spouse but they are not required to do so, and many do not lower the amount. These amounts are approximate and vary slightly by Consulate. You must apply outside of Mexico at a Mexican Consulate or Embassy, except in certain circumstances (ie. marriage to a Mexican citizen). Some Consulates are walk-in and some require appointments. You can schedule your Consular appointment by calling 1-404-266-2233 (ext 250) (Atlanta Area in USA) or online by using the button below. Each person will need a separate appointment time slot, even minor children. If you have purchased our Visa package we can schedule the appointment for you if you want. The Residente Temporal Visa will be issued for 1 year and may be renewed in Mexico for an additional 1, 2, or 3 more years. After 4 years you may obtain a Residente Permanente Visa by applying in Mexico or you may leave Mexico and enter again as a Tourist on an FMM Card or apply again outside of Mexico for another Residente Temporal Visa. Mexican Consulate visa application form to be printed, completed and taken with you. Complete questions 1- 25. Color with white background, your face uncovered, no eyeglasses, front view. Original Passport plus a copy. Financials: 12 months of individual printouts for savings/investments and/or 6 months of individual bank printouts showing employment or pension income and/or proof of home ownership in Mexico. Take as much proof of income as you possibly can. You can not have too much proof of income. Residente Temporal Visa holders must notify their local INM Ofiice whenever their status changes. If you change address, marital status, death of spouse, change citizenship or jobs you have 90 days to notify INM. The process requires an online form to be completed. You then present that along with a letter, passport and Visa as well as other documents relating to the change of status. INM will send you an email in about 2-3 weeks letting you know your status change has been accepted. The work VISA (Permiso Para Trabajar) can be applied for if you wish to work in Mexico while holding a Residente Temporal Visa. It is issued to those who already have a Temporary Resident visa and who wish to earn Mexican sourced income. This is not the same as anyone being hired by a Mexican company or employer. This is for artists, web designers, musicians, people renting rooms in their homes (AirBNB, HomeAway, VRBO, etc...) typically single person work that does not involve other employees. You should consult with an attorney or accountant to make sure you choose the right options for your work field. Here in Acapulco we have a great consultant that can work with you at reasonable rates. To begin the registration process you will need an RFC (Like A Social Security Number in the USA). You can register it online at SAT. Register for an RFC) then make an appointment on-line with your local SAT office (Mexico Tax Authority) Make Appointment Here), and then going to the appointment to finalize your registration and receive your password. You will also receive a cedula (QR code). Once com0pleted ask them to print out for you a piece of paper called a Constancia which you will need to register for your work VISA with INM. Once you have registered with SAT, you must apply at INM (Mexico Immigration) for your Permiso Para Trabajar Visa (Work Visa). You will need to make the fee payment at a local bank, fill out certain forms, photos, finger prints, etc., much the same as when you finished your Residente Temoporal VISA. Please keep in mind this section above is only for Residente Temporal VISA holders. Residente Permante VISA holders have the right to work included in their VISA. To become a Resident Permanente (Permanent Resident) you must meet minimum financial requirements (each person). If your bank accounts, investment accounts or any proof of income accounts are in both you and your spouses names the statements provided to the Consulate must have both names printed on them. Most Consulates want originals and not copies. If you only have online statements you may need to print them and go to your bank or financial institution and have them stamp and sign/initial each page. You may also need a letter from the branch/office manager stating the documents are issued by them. The Residente Permanente Visa allows you to live in Mexico full time. The Visa never expires and you have the right to work with this Visa type. Residente Permanente Visa holders may not import or drive a Foreign plated vehicle. Children with a Residente Permanente Visa between the ages of 1 and 3 must renew their Visas every year. Children 3-18 years of age must renew every 4 years. You will visit a Mexican Consulate, provide the required documents and, if approved, be given a Pre-Approved Temporal or Permanente VISA in your Passport Book. This Pre-Approved Visa is valid for entry into Mexico only 1 time and you must enter Mexico within 180 days of issuance. Once in Mexico you have 30 Days to report to your local INM Office to begin the final process to complete the Visa.